The “Foamposite” technology is making a lot of heads turn after it was applied in different shoes released last year and earlier this year, and the Jordan Brand won’t be left behind, and as promised they are set to release a shoe featuring the technology. 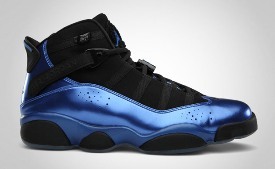 Featuring the Foamposite technology, Jordan Brand is set to release the Jordan 6 Rings on Saturday that will come out in Black/Varsity Royal colourway, which is the second installment of the shoe this month. The Black/Dark Charcoal edition was released last week, but the upcoming edition boast a more appealing colourway with a royal blue upper part and mudguard, making it one of the most anticipated shoe, not only for the month of February, but also for the entire year of 2011. So start saving money now and buy one this weekend! A New Color of Air Jordan 6-17-23 OUT this Saturday!